The Polygraph Exam  takes approximately two  to four  hours to complete and is given in three  phases. Initiating an exam, following introductions, an examiner will ask the examinee to sign a consent form stating their willingness to take the polygraph exam. The examinee will also be informed about their right against self-incrimination and their right to speak and consult with an attorney. Two pneumograph tubes that are place around your chest and stomach to measure respiration. Small cuffs that are attached to your fingertips to measure electro-dermal activity. 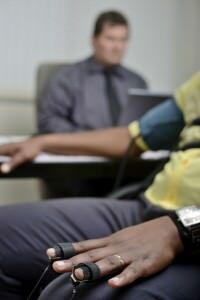 A blood pressure cuff to measure blood flow and heart rate. A sensor pad on chair seat to detect movement. The instrument typically used can best be described as a physiological recorder that monitors/records a person’s autonomic arousal using 1.] heart rate and blood pressure; 2.] respiration; and 3.] skin conductivity. Most examiners today use computerized recording platform systems. The rate and depth of respiration are typically measured by a pneumograph wrapped around an examine’s chest, with cardiovascular activity assessed using a blood pressure cuff. Skin conductivity called, “the galvanic skin or electro dermal response,” is measured using electrodes attached to the examinee’s fingertips. Questions posed by an examiner will be reviewed before any test begins, and the examine is given an opportunity to discuss any concerns and ask questions about the process and the polygraph exam. The will be told questions can only be answered using “yes” or “no” answers. The examiner will also explain being nervous will “not” affect the polygraph exam’s results … that examiners generally expect people to be nervous. Because everyone is different, the examiner will explain each instrument is adjusted to read an examinee’s physiology, and thereafter look for changes. The examiner will conduct a “stimulation test,” demonstrating the machine’s accuracy for detecting deception. The examinee will be reminded every polygraph exam is voluntary, and the examine e can terminate the polygraph exam any time. The pretest phase is designed to ensure that the examinee understands the questions and process, and induce a level of concern about being deceptive. During the In-test phase, the examinee will be asked both relevant and non-relevant questions while hooked up to the polygraph, with the examiner analyzing the chart as questions are being asked. This phase takes about five to six minutes and can be repeated three to six times. Several questioning techniques can be used conducting a polygraph exam. If the polygraph exam is deemed “inconclusive” or “deceptive,” the examinee might be questioned about their responses. Problem questions can be rephrased/discussed before the In-Test phase is repeated. Upon conclusion, the examiner will reach a “preliminary” decision regarding the results of the polygraph exam, but the examiner will not discuss his/her decision until the chart has been reviewed for quality control and validated by another examiner. Directory members can be extremely helpful to anyone seeking information and/or requiring a professional opinion concerning investigations involving the polygraph exam. Accordingly, looking for information about the polygraph exam and/or an expert concerning investigations involving a polygraph exam—please draw upon the website’s search feature, entering the appropriate skill, issue, or need as well as the geographical area of preference desired to make contact with an FBI specialist. Retired FBI Agents and Analysts familiar with the polygraph exam and/or are polygraph examiners, interested in securing a Directory listing and/or a personal email address, should submit an online application requesting membership. Information and content taken from article captioned, “How to Prepare for a Security Clearance Polygraph Examination,” written by WILLIAM HENDERSON, dated June 6, 2011. It should be noted Applicants seeking employment with the Government will also undergo an exhausting Personnel Security Interview [PSI] before the polygraph exam wherein any issue and/or concern can be asked and addressed. See section headed, “Findings,” at http://www.apa.org/research/action/polygraph.aspx. See section headed, “Findings,” and Control Question Test at http://www.apa.org/research/action/polygraph.aspx.